Published on January 6, 2015 in architecture and style. Closed Tags: Cape Cod, Cape Cod condo sales, Cape Cod new construction, Cape cod real estate sales, Provincetown real estate, Truro Real Estate. Fun post by Jazmine at Curbed.com. Time to make up a bunch of awards for the best, worst and most absurd things that happened in Cape & Islands real estate, architecture and neighborhoods. Here now, your 2014 Curbed Awards. It’s time to squeeze into Cape Cod’s tiniest listings of 2014. From a wicked wee 162-square-feet to a rather roomy 296-square-feet, here are 10 microhomes that will no doubt cause a shudder amongst claustrophobics, micro-living haters and/or McMansion lovers. Kicking off in Truro, this cute 296-square-foot cottage condo with expansion potential (boo!) was listed for $249,000. Currently a lovely little cottage, this Chatham “investment property”has “growth opportunity” to add a two-bedroom rental. The 288-square-footer hit the market asking $299,000 and is now hoping for $274,000. Water views, access to a private beach on Cape Cod Bay and 272-sq.-ft.were looking for $199,000 in Truro. 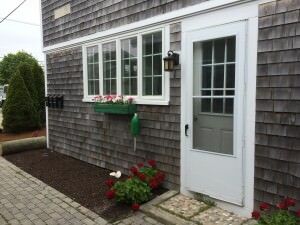 Breakfast in bed is available in this wicked tiny, as in 252-sq-ft., West Yarmouth cottage condo for $79,900. Located next to Truro Vineyards (!! ), this 234-sq.-ft. studio condo – with the smallest kitchen sink ever – hit the market in early May for $99,000 and by the end of the month, had sold for $92,000. Cheers! When we wrote about this Commercial Street condo back in March, the198-square-footer had been pricechopped down to $219,900. By June, a buyer had squeezed into the place for $196,000. Built in 1900, this “sweet attached cottage, known as Cormorant offers a piece of increasingly rare old Provincetown charm.” The asking price for the 186-square-footer is $245,000. This 182-sq.-ft. West Yarmouth cottage lacks a full bathroom, but at least there’s an outdoor shower with hot and cold. Asking price is now$89,000. Finally, to the tiniest cottage for sale on Cape Cod. The wee West Yarmouth abode, all 162-sq.-ft., is yours for $69,900. …and I will add one of our charming listings in Provincetown to the list. 3 Bradford Street #1 in Provincetown being marketed at $249K, and #2 is available for $229K. Right in the middle of the desirable West End 1/2 block to Victors Restaurant and a 5 minute walk to the beaches and to the center of town. These condos are in a small 5 unit association and each has exclusive use outside patios and gardens, and parking. Each condo is 278 square feet big!